Jen has spent nearly 20 years as a storyteller. Starting in theatre, she moved into print journalism, radio, and eventually became a new media writer and digital interactive producer. Her writing revolves primarily around arts, local issues, and character-driven stories. She has a strong track record of working closely with Indigenous creators. Jen has worked extensively in Radio production for both CBC and Roundhouse Radio. She has created dozens of audio documentaries for CBC, on topics ranging from Downtown East-Side gentrification to the merits of PNE Lawn Parking. Her 2016 audio documentary for CBC’s Ideas, The Dream of Brother XII, details the strange life of a cult leader who lived near Nanaimo in the 1920s. 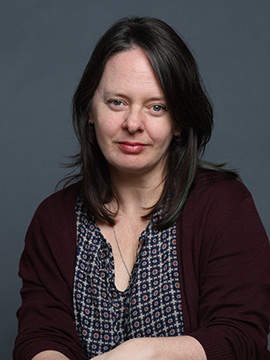 She was story editor and/or interactive story producer on numerous award-winning interactive projects, including Bear 71 (NFB), Seven Digital Deadly Sins (The Guardian), Hyperlocal (CBC), Life on Hold (Al Jazeera), and The Last Hunt (NFB). A graduate of the UBC Creative Writing Program, Jen Moss teaches Creative Writing for New Media, and Creative Writing for podcasting. She is interested in cross-genre and cross-departmental collaboration, and in continually exploring how emerging technologies open new doorways for writers.